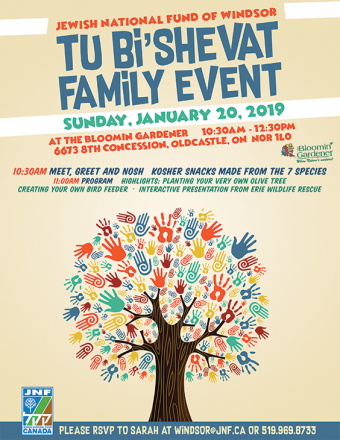 Celebrate Tu Bi’Shevat with the JNF of Windsor! After some nosh, families will plant their own olive tree, create bird feeders and enjoy a fun presentation from Erie Wildlife Rescue. RSVP to Sarah at Windsor@JNF.CA.